Are you thinking about divorce? Are you concerned or even frightened of the consequences? Do you need help with a family law issue, such as obtaining visitation rights, a paternity dispute, or creating a prenuptial agreement? Any family law issue can be a very personal and private matter, involving all kinds of emotional impact. To resolve these issues, you want a family law attorney you can talk to, someone you can trust, an advocate who will protect your rights and interests and work to achieve your objectives. You will find such a lawyer at our firm. No case is too big or too small for our legal team. We are an intimate boutique law firm that cares about the people we represent. Because of this, we can take the time to work closely with our clients providing them with the personalized attention they might not find at large, corporate law offices. We pride ourselves on the quality of service we provide for our clients, offering flexible fee structures and options. When you work with an attorney at our firm, you can rest assured that you are in caring and capable hands. At our office, we handle all methods of marriage dissolution, including divorce, military divorce and legal separation agreements. In cases of uncontested divorce where the couple is at a place of irreconcilable differences, there can be significant strife over issues such as property division and child custody. It is imperative that you have a representative that can protect your rights throughout the entire legal process and seek to get you the positive results you desire. When couples choose to negotiate a settlement through their separation this is called a collaborative divorce. This means that the spouses have agreed to figure out a divorce plan that is agreeable for both parties. Often neutral parties and experienced lawyers must step in for this to happen. 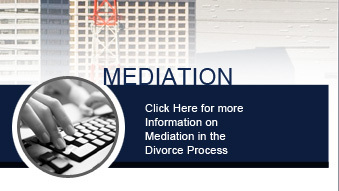 For partners who chose to resolve their divorce through mediation, we provide the counsel and guidance to help you and your spouse work through this process which takes place outside of the courtroom. It is typically less costly and more quickly resolved. Couples must be able to come to an arrangement on issues such as child custody and child support in each of these situations. Everyone involved in the process must always place the best interests of any children involved at the forefront of discussions and seek to come to an amicable end result. Our firm can help you reach that favorable outcome that is most beneficial for your entire family. Other issues that are discussed in divorce include spousal support and alimony. Both of these topics involve one spouse giving financially to the other so that a certain standard of living may be met. This is decided by the courts and is not required in all divorce settlements. Agreeing upon these issues can be extremely difficult and some individuals experience problems with their agreement even after the divorce has been finalized. Our firm is highly experienced at helping individuals seek enforcement of settlements in situations where the other party does not follow through with support payments or custody agreements. We can also help you seek modification of settlements when you experience a change in life that renders you unable to pay your child or spousal support. These kinds of modifications can also be extremely helpful if you know that your ex-spouse has been abusive towards your child in any way. The Department of Children's and Family Services may file a petition with the courts for a juvenile dependency case in these situations so that your son or daughter may be rescued from neglect. Regardless of the family law issues you are dealing with, you can rest assured knowing that we truly care about you and your future. In matters regarding grandparents' rights in the event of a divorce, our lawyers can represent you in a way that can help you achieve custody or visitation rights for your grandchildren. If you have remarried after a divorce and your spouse wants to obtain parental rights over your child, we are skilled at assisting those in the step-parent adoption process as well. At the firm, our legal team understands the importance of your case. It will be our main priority to protect the rights of our clients and their children during any family law matter in Los Angeles. When you choose to work with a knowledgeable and compassionate divorce and family law attorney, you gain the comfort of knowing that a legal advocate is on your side. You can rest more easily knowing that your rights will always be protected and your future safeguarded during this difficult time. When it comes time to make decisions such as child custody and property division, two aspects of divorce that must be finalized before the divorce is complete, you will have the confidence of an experienced family lawyer on your side. Our firm can also help you make any difficult decision during your divorce and steer you in the right direction, should you stray from your intended path. We understand the need for resolution in all family law matters, especially the highly-charged areas of divorce and where children are concerned. Getting your family legal issues handled in an efficient and timely manner are important so that you can get on with the important business of living your life, raising your children, and creating the future. Whatever family law issues you are facing, whether it is a complicated, high-asset divorce or a something simpler, you will want to know that your case is being handled by a competent attorney who is familiar with these situations. The founding attorney at our firm only handles family law matters and does so with a sensible and reasonable manner while still maintaining his overriding commitment to each client. 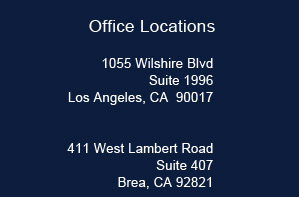 If you want a dedicated family lawyer who is focused solely on family law, contact our firm for a case consultation by calling (213) 550-5059 for our Los Angeles office or (714) 907-4585 for our office in Brea. Photos of Mr. Burt courtesy of www.verofotorocks.com.